Patroness of Women, penitent sinners, pharmacists, prostitutes, sexual temptations, hairdressers. St Mary Magdalene, you came with springing tears to the spring of mercy, Christ; from him your burning thirst was abundantly refreshed through him your sins were forgiven; by him your bitter sorrow was consoled. My dearest lady, well you know by your own life how a sinful soul can be reconciled with its creator, what counsel a soul in misery needs, what medicine will restore the sick to health. Most blessed lady, I who am the most evil and sinful of men do not recall your sins as a reproach, but call upon the boundless mercy by which they were blotted out. Therefore, since you are now with the chosen because you are beloved and are beloved because you are chosen of God, 1, in my misery, pray to you, in bliss; in my darkness, I ask for light; in my sins, redemption; impure, I ask for purity. But you, most holy Lord, why do you ask her why she weeps? Surely you can see; her heart, the dear life of her soul, is cruelly slain. you hung on the wood, pierced by iron nails, stretched out like a thief for the mockery of wicked men; and yet, 'Woman,' you say, 'why are you weeping?' She had not been able to prevent them from killing you, but at least she longed to keep your body for a while with ointments lest it decay. No longer able to speak with you living, at least she could mourn for you dead. So, near to death and hating her own life, she repeats in broken tones the words of life which she had heard from the living. For she had seen with her own eyes--if she could bear to look--what cruel men cruelly did to you; and now all that was left of you from their hands she thinks she has lost. All hope of you has fled, for now she has not even your lifeless body to remind her of you. Have you put off compassion now you have put on incorruption? Did you let go of goodness when you laid hold of immortality? You will not despise us mortals now you have made yourself immortal, for you made yourself a mortal in order to give us immortality. The Lord calls his servant by the name she has often heard and the servant knows the voice of her own Lord. I think, or rather I am sure, that she responded to the gentle tone with which he was accustomed to call, 'Mary'. What joy filled that voice, so gentle and full of love. But in truth, you who are very truth, you know me well and can testify that I write this for the love of your love, my Lord, my most dear Jesus. I want your love to burn in me as you command so that I may desire to love you alone and sacrifice to you a troubled spirit, 'a broken and a contrite heart'. Give me, 0 Lord, in this exile, the bread of tears and sorrow for which I hunger more than for any choice delights. Redeemer, my good Jesus, do not despise the prayers of one who has sinned against you but strengthen the efforts of a weakling that loves you. Shake my heart out of its indolence, Lord, and in the ardour of your love bring me to the everlasting sight of your glory where with the Father and the Holy Spirit you live and reign, God, for ever. Amen. Who didst enter the Pharisee's house to anoint the feet of Jesus, Pray for us. Disciple of Our Lord,Pray for us. Wounded with the love of Christ, Pray for us. Most dear to the Heart of Jesus, Pray for us. Constant woman, Pray for us. Last at the Cross of Jesus, first at His tomb, Pray for us. Thou who wast the first to see Jesus risen, Pray for us. Whose forehead was sanctified by the touch of thy risen Master, Pray for us. Apostle of apostles, Pray for us. Who didst choose the "better part,"Pray for us. Who lived for many years in solitude being miraculously fed, Pray for us. Who wast visited by angels seven times a day, Pray for us. Sweet advocate of sinners, Pray for us. Spouse of the King of Glory, Pray for us. 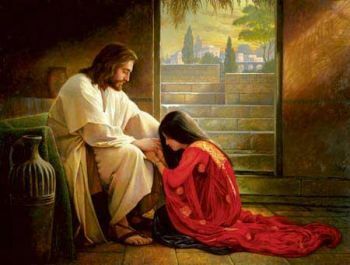 V. Saint Mary Magdalene, earnestly intercede for us with thy Divine Master R. That we may share thy happiness in heaven. Let us pray. May the glorious merits of blessed Mary Magdalene, we beseech Thee, O Lord, make our offerings acceptable to Thee: for Thine only-begotten Son vouchsafed graciously to accept the humble service she rendered. Who livest and reignest with Thee and the Holy Ghost, God for ever and ever. R. Amen. May the prayers of blessed Mary Magdalene help us, O Lord : for it was in answer to them that Thou didst call her brother Lazarus, four days after death, back from the grave to life. Who livest and reignest with the Father and the Holy Ghost, Unity in Trinity, world without end. R. Amen.